"Air pressure" redirects here. For the pressure of air in other systems, see Pressure. Atmospheric pressure, sometimes also called barometric pressure (after the sensor), is the pressure within the atmosphere of Earth (or that of another planet). The standard atmosphere (symbol: atm) is a unit of pressure defined as 1013.25 mbar (101325 Pa), equivalent to 760 mmHg (torr), 29.9212 inches Hg, or 14.696 psi. The atm unit is roughly equivalent to the mean sea-level atmospheric pressure on Earth, that is, the Earth's atmospheric pressure at sea level is approximately 1 atm. In most circumstances atmospheric pressure is closely approximated by the hydrostatic pressure caused by the weight of air above the measurement point. As elevation increases, there is less overlying atmospheric mass, so that atmospheric pressure decreases with increasing elevation. Pressure measures force per unit area, with SI units of Pascals (1 pascal = 1 newton per square metre, 1 N/m2). On average, a column of air with a cross-sectional area of 1 square centimetre (cm2), measured from mean (average) sea level to the top of Earth's atmosphere, has a mass of about 1.03 kilogram and exerts a force or "weight" of about 10.1 newtons or 2.37 lbf, resulting in a pressure at sea level of about 10.1 N/cm2 or 101 kN/m2 (101 kilopascals, kPa). A column of air with a cross-sectional area of 1 in2 (6.45 cm2) would have a mass of about 6.65 kg and a weight of about 65.4 N or 14.7 lbf, resulting in a pressure of 10.1 N/cm2 or 14.7 lbf/in2. Atmospheric pressure is caused by the gravitational attraction of the planet on the atmospheric gases above the surface, and is a function of the mass of the planet, the radius of the surface, and the amount and composition of the gases and their vertical distribution in the atmosphere. It is modified by the planetary rotation and local effects such as wind velocity, density variations due to temperature and variations in composition. 15-year average mean sea-level pressure for June, July, and August (top) and December, January, and February (bottom). ERA-15 re-analysis. Kollsman-type barometric aircraft altimeter (as used in North America) displaying an altitude of 80 ft (24 m). The mean sea-level pressure (MSLP) is the average atmospheric pressure at mean sea level. This is the atmospheric pressure normally given in weather reports on radio, television, and newspapers or on the Internet. When barometers in the home are set to match the local weather reports, they measure pressure adjusted to sea level, not the actual local atmospheric pressure. The altimeter setting in aviation is an atmospheric pressure adjustment. Average sea-level pressure is 1013.25 mbar (101.325 kPa; 29.921 inHg; 760.00 mmHg). In aviation, weather reports (METAR), QNH is transmitted around the world in millibars or hectopascals (1 hectopascal = 1 millibar), except in the United States, Canada, and Colombia where it is reported in inches of mercury (to two decimal places). The United States and Canada also report sea-level pressure SLP, which is adjusted to sea level by a different method, in the remarks section, not in the internationally transmitted part of the code, in hectopascals or millibars. However, in Canada's public weather reports, sea level pressure is instead reported in kilopascals. In the US weather code remarks, three digits are all that are transmitted; decimal points and the one or two most significant digits are omitted: 1013.2 mbar (101.32 kPa) is transmitted as 132; 1000.0 mbar (100.00 kPa) is transmitted as 000; 998.7 mbar is transmitted as 987; etc. The highest sea-level pressure on Earth occurs in Siberia, where the Siberian High often attains a sea-level pressure above 1050 mbar (105 kPa; 31 inHg), with record highs close to 1085 mbar (108.5 kPa; 32.0 inHg). The lowest measurable sea-level pressure is found at the centers of tropical cyclones and tornadoes, with a record low of 870 mbar (87 kPa; 26 inHg) (see Atmospheric pressure records). "Surface pressure" redirects here. For surface pressure in physical chemistry, see Pressure § Surface pressure and surface tension. Surface pressure is the atmospheric pressure at a location on Earth's surface (terrain and oceans). It is directly proportional to the mass of air over that location. For numerical reasons, atmospheric models such as general circulation models (GCMs) usually predict the nondimensional logarithm of surface pressure. The average value of surface pressure on Earth is 985 hPa. This is in contrast to mean sea-level pressure, which involves the extrapolation of pressure to sea-level for locations above or below sea-level. The average pressure at mean sea-level (MSL) in the International Standard Atmosphere (ISA) is 1013.25 hPa, or 1 atmosphere (Atm), or 29.92 inches of mercury. Pressure (P), mass (m), and the acceleration due to gravity (g), are related by P = F/A = (m*g)/A, where A is surface area. Atmospheric pressure is thus proportional to the weight per unit area of the atmospheric mass above that location. 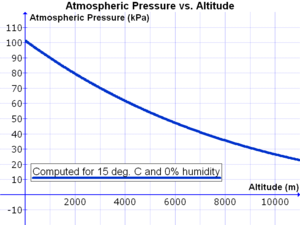 Variation in atmospheric pressure with altitude, computed for 15 °C and 0% relative humidity. This plastic bottle was sealed at approximately 14,000 feet (4,300 m) altitude, and was crushed by the increase in atmospheric pressure, recorded at 9,000 feet (2,700 m) and 1,000 feet (300 m), as it was brought down towards sea level. Pressure on Earth varies with the altitude of the surface; so air pressure on mountains is usually lower than air pressure at sea level. Pressure varies smoothly from the Earth's surface to the top of the mesosphere. Although the pressure changes with the weather, NASA has averaged the conditions for all parts of the earth year-round. As altitude increases, atmospheric pressure decreases. One can calculate the atmospheric pressure at a given altitude. Temperature and humidity also affect the atmospheric pressure, and it is necessary to know these to compute an accurate figure. The graph at right was developed for a temperature of 15 °C and a relative humidity of 0%. Atmospheric pressure varies widely on Earth, and these changes are important in studying weather and climate. See pressure system for the effects of air pressure variations on weather. Atmospheric pressure shows a diurnal or semidiurnal (twice-daily) cycle caused by global atmospheric tides. This effect is strongest in tropical zones, with an amplitude of a few millibars, and almost zero in polar areas. These variations have two superimposed cycles, a circadian (24 h) cycle and semi-circadian (12 h) cycle. The highest adjusted-to-sea level barometric pressure ever recorded on Earth (above 750 meters) was 1084.8 hPa (32.03 inHg) measured in Tosontsengel, Mongolia on 19 December 2001. The highest adjusted-to-sea level barometric pressure ever recorded (below 750 meters) was at Agata in Evenk Autonomous Okrug, Russia (66°53’ N, 93°28’ E, elevation: 261 m, 856 ft) on 31 December 1968 of 1083.8 hPa (32.005 inHg). The discrimination is due to the problematic assumptions (assuming a standard lapse rate) associated with reduction of sea level from high elevations. The Dead Sea, the lowest place on Earth at 430 metres (1,410 ft) below sea level, has a correspondingly high typical atmospheric pressure of 1065 hPa. The lowest non-tornadic atmospheric pressure ever measured was 870 hPa (0.858 atm; 25.69 inHg), set on 12 October 1979, during Typhoon Tip in the western Pacific Ocean. The measurement was based on an instrumental observation made from a reconnaissance aircraft. One atmosphere (101.325 kPa or 14.7 psi) is also the pressure caused by the weight of a column of fresh water of approximately 10.3 m (33.8 ft). Thus, a diver 10.3 m underwater experiences a pressure of about 2 atmospheres (1 atm of air plus 1 atm of water). Conversely, 10.3 m is the maximum height to which water can be raised using suction under standard atmospheric conditions. Low pressures such as natural gas lines are sometimes specified in inches of water, typically written as w.c. (water column) gauge or w.g. (inches water gauge). A typical gas-using residential appliance in the US is rated for a maximum of 14 w.g., which is approximately 1048.37 hPa. Similar metric units with a wide variety of names and notation based on millimetres, centimetres or metres are now less commonly used. Pure water boils at 100 °C (212 °F) at earth's standard atmospheric pressure. The boiling point is the temperature at which the vapor pressure is equal to the atmospheric pressure around the water. Because of this, the boiling point of water is lower at lower pressure and higher at higher pressure. Cooking at high elevations, therefore, requires adjustments to recipes or pressure cooking. 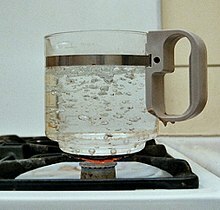 A rough approximation of elevation can be obtained by measuring the temperature at which water boils; in the mid-19th century, this method was used by explorers. An important application of the knowledge that atmospheric pressure varies directly with altitude was in determining the height of hills and mountains thanks to the availability of reliable pressure measurement devices. While in 1774, Maskelyne was confirming Newton's theory of gravitation at and on Schiehallion in Scotland (using plumb bob deviation to show the effect of gravity) and accurately measure elevation, William Roy using barometric pressure was able to confirm his height determinations, the agreement being to within one meter (3.28 feet). This method became and continues to be useful for survey work and map making. This early application of science gave people insight into how science could easily be put to practical use. Barotrauma – Injury caused by pressure – physical damage to body tissues caused by a difference in pressure between an air space inside or beside the body and the surrounding gas or liquid. International Standard Atmosphere – Atmospheric model, a tabulation of typical variation of principal thermodynamic variables of the atmosphere (pressure, density, temperature, etc.) with altitude, at middle latitudes. ^ International Civil Aviation Organization. Manual of the ICAO Standard Atmosphere, Doc 7488-CD, Third Edition, 1993. ISBN 92-9194-004-6. ^ "atmospheric pressure (encyclopedic entry)". National Geographic. Retrieved 28 February 2018. ^ "Q & A: Pressure - Gravity Matters?". Department of Physics. University of Illinois Urbana-Champaign. Retrieved 28 February 2018. ^ Jacob, Daniel J. Introduction to Atmospheric Chemistry. Princeton University Press, 1999. ^ Chris Landsea (2010-04-21). "Subject: E1), Which is the most intense tropical cyclone on record?". Atlantic Oceanographic and Meteorological Laboratory. Archived from the original on 6 December 2010. Retrieved 2010-11-23. ^ Berberan-Santos, M. N.; Bodunov, E. N.; Pogliani, L. (1997). "On the barometric formula". American Journal of Physics. 65 (5): 404–412. Bibcode:1997AmJPh..65..404B. doi:10.1119/1.18555. Test showing a can being crushed after boiling water inside it, then moving it into a tub of ice cold water.